Shorewood is hands down one of our most requested locations for repeat The property is gorgeous, the views are great, the pool is the hot tub and children's pool, the grounds are gated. With a balcony accessible by the living room and master bedroom, guests staying in Shorewood 333 enjoy a great view of the Atlantic Ocean and the Shorewood pool area. After hours in the surf, vacationers return from the ocean via Shorewood's beach walkway and then dip into the freshwater swimming pool or a seasonally heated spa. Pool is Heated March 1 - April 30 and Oct 1 - November 30. Shorewood is a five story elevator building located in South Forest Beach. Among the amenities offered throughout Hilton Head Island, Shorewood is two blocks from the Coligny Beach Market, a quaint downtown area that offers guests a wide selection of restaurants, shopping venues, and entertainment for all ages. The kitchen & baths in Shorewood 333 have been renovated including a walk-in master shower. King in the master, 2 Twins in the 2nd plus a queen size sleeper sofa in the living room. Our condo had a beautiful view of the ocean. We sat on the patio each morning enjoying the view with our coffee. The ocean was an easy short walk across the parking lot and pool.The place was clean and the directions we got were spot on. Was happy with the whole booking process. The furnishings were a little outdated and the towels were rather thin, but otherwise no complaints. It was close and convenient to shops and restaurants. Would recommend and would stay there again." we stayed n this unit once before, last time the boch washer was knocking gears badly,i noticed he replaced it with a maytag,as a property manager myself, i believe due to the smaller size of the washer you most likely will have re-occuring problems with the washing machine, I want to re-book this same unit for october 2018 around the 8th or 10th for either 8,9,or 10 days e-mail me in september to set it up"
Had a great time for our first visit, great location, excellent view, and friendly staff. There was some landscaping going on during our stay but did not intrude." Had a wonderful stay. Condo was very nice"
This property is a good value when considering other options. I've broken down some positives and negatives below. Overall, I think this is a great introduction to Hilton Head. As you spend more time there, you can better determine the ideal location. Not having access to Sea Pines biking trails was a big deal to us, and a reason why we may not consider this unit in the future. The coligny area is nice, but can be busy being a public beach. 1. Beach Access: It's easy to get to the beach from the pool, and there aren't any stairs. The beach path is relatively short. There are nice showers and a hose for washing off sand. 2. Pool: Good size, and perfect for younger children being that there is a 'beach entry' style part of the pool. 3. 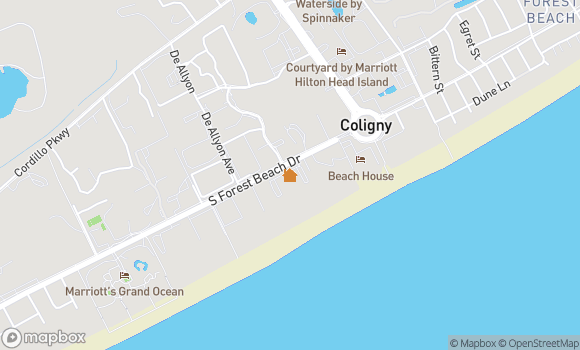 Location: You can bike or walk easily up to Coligny where there are grocery and restaurant options. 4. Rental Company: The company was easy to work with and the keyless entry capability is a nice feature. You don't have to worry about keeping track of a key, and when you check out, there isn't a need to go by the rental office, you just hit the road. 1. Riding Bikes: There are limited bike paths that have scenery. The best biking is in Sea Pines, and you aren't allowed to take a bike in there, so you are limited to the bike paths along busier roads or you can bike on the beach. 2. Decor: The furniture is dated, but this wasn't a big deal to us. I think you can get an accurate feel from the pictures. We stayed a 3rd time in that villa and the owners upgrade and maintain the unit constantly. Excellent location." The Shorewood is our most favorite place to stay as it is a very nice complex within walking/bike riding to many restaurants, shopping, grocery stores. The condo we rented this year was okay. I would rent it again, however it definitely could use a new paint job inside and updated living room furniture. Also the bathroom plumbing definitely needs some improvement. The view was magnificent. The best meal we had was from One Hot Mama's, which has been our favorite the last couple of years. We have not had a bad meal there. We went on the Happy Hour Cruise at South Beach and saw dolphins and thoroughly enjoyed it. " Good time not crowded. Beach leaves a lot to be desired more like a parking lot no comparison to Outer Banks of Myrtle beach. " This was our second year in a row in unit 333. We enjoyed our stay enough last year to book again but the one complaint last year was not addressed and there were more issues this year. The wash machine needs to be replaced. The smell that comes from it is awful. It also leaves brown marks on the clothes. We had to call to have someone come out both years. Also this year the floor was cracked with sharp edges exposed. It was covered with a strip of scotch tape which is dangerous. The showers had mold in them this year and there was food under the furniture. The cleaning of this unit needs to be changed. It was filthy and smelled like mold in the unit. The pool was a dissapointmet as well. The filter was not working most of the week and the pool was dirty. The manager usually does an exceptional job I was shocked. He did come and take care of it but not until late Thursday. Our family has been staying at the Shorewood for over 10 years and dill"
Floor tile cracked. Beds were very uncomfortable. Living room furniture needed to be updated. For the price, this condo appeared to be updated but only the kitchen counter was. Once you looked at condo, it was not clean. Coke can and garbage behind sofa was found.. DId not realize the pool was a salt water pool. Would not recommend this agency or condo." Beautiful view.Condo is in center of bldg. and overlooks the pool and ocean. Several repairs were needed during our 3 month stay. All were quickly completed. Love staying here and hope to again." Good view. Room was clean and well furnished. High enough up you could see over the trees. The Wifi didn't work well and was not secured." Great place to stay. " This unit was in a prime location. The views of the pool and the ocean were beautiful! Our teenage girls loved the fact that they could walk out our doors and be at the beach in just minutes. We were very close to Caligny Beach and Village. A very nice market place. We were also a short walk to The Fitness Place. For $40/week all four of us could work out daily. The walk to the facility was scenic. We liked the close proximity to Sea Pines Resort/HarbourTown and South Beach. All within a very short drive of 333 Shorewood. If I could make a few suggestions to potential renters: While this unit has a beautiful view of the ocean and is in a great location, if you're planning to use the kitchen to cook, be sure to bring your own spices and condiments. There was nothing in the unit to add to foods while cooking. I had read this before we left for our destination so I brought salt/pepper, grated cheese, and a garlic bulb. This was just enough for us, but certainly consider other spices if you're planning to cook. Also, the unit does not provide "extra" toilet tissue, dishwasher detergent, or paper towels. Bring glass cleaner as the dining room table has a glass tabletop.They provide one extra trash can liner per bathroom & kitchen. I brought along extra trash bags and we did use them. They do provide towels and bed linens. Overall, we had a wonderful experience. I would recommend this unit to anyone who is looking to experience Hilton Head Island with his/her family as this is a VERY family oriented place!" The entire facility is lovely and works great with families. Easy access to the pool and the beach. The ocean view from our unit was just beautiful." We had a great stay at Shorewood. The grounds are beautifully maintained as well as the structures. We felt very spoiled with the covered parking for our unit. The pool area was perfect for our 20mo and 4 year old. A very short easy walk to the beach, the location was wonderful. We also enjoyed being able to walk to Coligny Plaza for dinner and ice cream. Everything else was a very short / easy drive. I would say our particular unit could use some updates. The bedding, lighting, and furniture are pretty dated. The kitchen and bathrooms have been updated. The front load Bosch washing machine takes almost a hour to run a load and the oven is extremely slow in pre-heating. There are zero spices, but most of the cookware you could need is provided. We would have loved a DVD player in either of the bedrooms, but the flat screen tv in the family room is nice. We stayed at the end of May and had perfect weather, low humidity, and barely any rain. We would definitely stay there again with our family. " Thanks to Buddy and his staff at Seashore, we were fixed up with an excellent Shorewood condo. We were late making reservations and we couldn't get oceanfront, but no matter. Shorewood 333 was a great unit with a great view. " The previous 10 years that we visited HHI we stayed at one of the ocean-front hotels. Now that I stayed at a condo I will never go back. The value is much better and it felt like home. Also Allison and the others in the rental office were great." No stress location, Patio looked out on to beach. Walking distance to Coligny and beach. Ample parking. Condo had great space and was clean. Only negative was two guest twin beds were not comfortable for the kids. " Our unit was updated and looking at the pool and ocean. We couldn't have asked for more. " Great location, this was our second year in this community, nice view, furniture was a little dated but we love shorewood, and would def. stay here again"
First of all, Seashore Vacations' staff were very attentive and friendly. The villa was great--location, cleanliness, condition. We were very pleased with our rental experience as we have been before through Seashore Vacation. Their service continues to be excellent." Property was clean and updated. great location right on beach and wonderful view from windows. Had all small kitchen utensils we needed Very friendly pool experience"
You can't go wrong on Hilton Head Island. Perfect relaxing getaway"
Renting from Seashore was a great experience. The condo was clean and perfectly located on South Forest Beach. " Rental process was very easy, staff very helpful. Shorewood 333 had a great view of the ocean and the pool. Unit was clean and very comfortable. Would recommend it." This condo is definitely very nicely appointed. Shorewood location near Coligny Plaza is very convenient. " Overall the condo was nice however could have been cleaner. Bed pillows were stained, kitchen area had bad smell. The refrigerator was not working properly(cooling) and the ice maker did not make ice. The problem was not corrected until Wednesday and then the ice maker still not work properly"
The unit was not very clean. It was Ok , but, the tables, lamps and floors were dusty and not what I would have liked to have seen when we arrived. Buddy and his people are always extremely professional and helpful. They even mailed some clothes back to us that we forgot." We loved the Shorewood. The location was great. Short walk to the beautiful beach." First stay in Shorewood and will likely be the location of choice for all future Hilton Head vacations. This is the 20th year staying on the island and I am looking forward to the next 20"
We had a lovely stay at an oceanfront Shorewood unit over the Thanksgiving holiday! Beautiful view, nice amenities, and a kitchen well-stocked enough to cook a Thanksgiving dinner in!!" The unit [#333 Shorewood] was basically OK. The bathrooms were not in good shape. The toilet in the main bedroom was not fastened to the floor and felt as if it would turn over. We ended up using the second bath due to the toilet situation. The king size bed was not comfortable as we could feel the springs pushing up into our backs. I will say that Buddy and all of his staff are always accomodating and pleasant to work with and that is the main reason that we always call him for rentals." "Thought owner should supply toilet paper, paper towels and weeks worth of dishwasher liquid and trash bags. Overall, we enjoyed ourselves thoroughly. We would definitely like to stay again. " The light bulbs in the 'master bath' should be replaced with lower wattage bulbs. Kitchen appliances should be replaced - fridge/washer/dryer. Would be more energy and cost efficient in the long run. Unit was great; well furnished and well equiped. Shorewood pool is outstanding and could be highlighted more in marketing material.."
The condo and complex were very nice. The washer and dryer set up was odd. The dryer was mounter so high on the wall I couldn't see into the drum or reach all the clothes and the washer shook so much during the spin cycle that it walked a couple of feet. The rental agreement states that we will provided with four sets of towels per bathroom which would be eight for ours, but the housekeepers only bring six sets. The same thing happened at my sister's condo."